Manchester United have announced the contract extension of manager, Jose Mourinho till 2020 with the extension of a further 12 months. 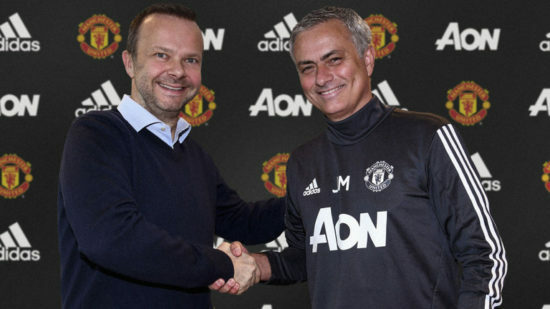 The 54-year-old Portuguese tactician who has led United to new heights since taking over at the club in 2016, was delighted at the prospect of taking the club to more success as he shook hands with chief executive, Ed Woodward. Mourinho has won trophies at Old Trafford and is in line for more success this term as we are still in the race actively for the FA Cup and Champions League. There had been questions about Mourinho’s future late last year given that he had cast admiring glances in the direction of high-spending PSG, but it would seem that he has been reassured about the club’s ambitions, especially with the acquisition of Alexis Sanchez from Arsenal. The manager is one of the best managers in world football, and has shown his brilliant managerial acumen in charge of our darling club, which goes to show that the future is bright. Since Sir Alex Ferguson retired in 2013, United have had a succession of managers that have not had the personality and winning mentality of the legendary gaffer, though Mourinho is proving that there may be life after the Scotsman after all. Speaking after the deal was agreed, he spoke of his delight at extending his stay in the managerial dugout. He said, “I am really honoured and proud to be Manchester United manager. I would like to say a big thank you to the owners and to Mr Woodward for the recognition of my hard work and dedication. “I am delighted they feel and trust that I am the right manager for this great club for the foreseeable future. We have set very high standards – winning three trophies in one season – but those are the standards I expect my teams to aim for. “We are creating the conditions for a brilliant and successful future for Manchester United.” He added. In 99 matches in charge of Manchester United, he has won 61, drawn 23 and lost 15 times, winning three trophies. We are placed second on the league table at the moment, face Sevilla in the Champions League next month and are still in the running for the FA Cup. Next : Sanchez the Saviour?